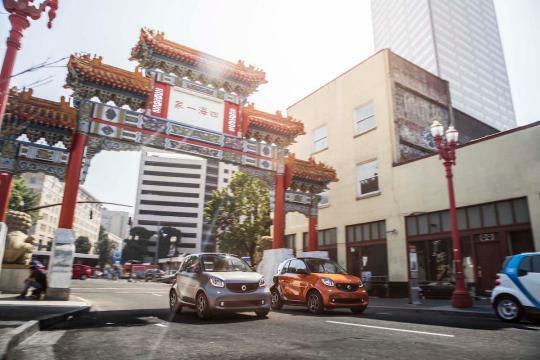 What It Is: 2016 Smart ForTwo, a small, inexpensive, rear-engine, two-door city car. Price Range: Starts at $14,650 for the base model with five-speed manual transmission, can go to more than $18,000 fully-loaded. Competitors: Fiat 500, Ford Fiesta, Chevy Spark, Mitsubishi Mirage, Toyota Prius C.
Alternatives: Honda Fit, Nissan Versa, a pedicab, the city bus, walking. Pros: Festive design, much less flimsy than previous edition, easy as a two-dollar Happy Hour shot to park, the greatest turning radius in history. Cons: Not fuel-efficient enough. Weird, inconsistent smartphone GPS software. Seventies-style highway noise and odor. Would I Buy One With My Own Money? Why would I need to buy a Smart when they’re just sitting there on the street, mine for the taking with the swipe of a card? Raise your hand if you know one person who owns a Smart. Now raise your hands if you know two people. I thought not. On the other hand, you probably know several people who drive Smart cars all the time, at least if you live in one of the dozen or so North American Car2Go cities. 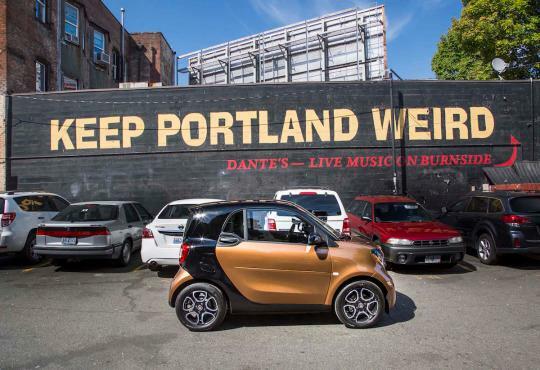 There are 350 in the fleet in Austin, where I live, and 550 in Portland, Oregon, where I tested the new Smart ForTwo last week. In a world of $2.50 a gallon gas and balloon loans for luxury cars, there’s not going to be an explosion of personally-owned Smarts, no matter how much better — and it is way better — the new version might be than the old one. The competition is pretty stiff for tiny cute cars. I don’t see the Honda Fit losing dominance or the Mini Cooper feeling threatened. Instead, what I saw and drove last week was less a preview of car ownership, and more a preview of car sharing. The Smart ForTwo is 8.8 feet long, and has a three cylinder engine that churns 89 hp and 100 ft-lb of torque to a maximum speed of 96 MPH. It goes 0 to 60 in 10.1 seconds, a little less with the six-speed automatic transmission, which is good enough for a highway merge, but not much more. That said, the previous Smart didn’t have power steering, power windows, or even a radio, and the new one has all those things, plus a Bluetooth alarm system, cruise control, the same crosswind assist system that Mercedes puts in its Sprinter vans, and optional rearview cameras and proximity warning systems. Although the outside panels are some sort of weird colorful reinforced plastic, they’ve been draped over a stiff steel safety cell, important in a car the relative size of a donut hole. 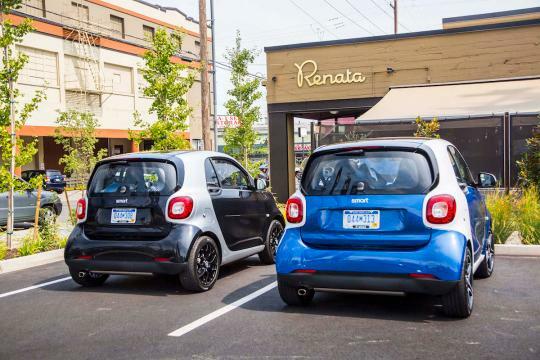 I drove the Smart ForTwo as it’s meant to be driven–in a crowded urban area, at mostly primetime hours. Portland, as advertised, had lots of narrow streets full of secret city missions. I handled those, as well as took highways up into Washington State, over to Oregon City, to hikes, everywhere. It felt a little slow at times, occassionally hitchy, and I could sometimes smell exhaust and hear the highway noise. This isn’t a modern sealed cabin meant to insulate you from reality, and it’s not fun to drive, unless you have a perverted sense of fun. The Smart wants to get you to dinner alive, not show you a good time. But never once did I have trouble finding a place to park. And every time a friend suddenly told me, “oh wait, turn here,” I was able to do so quickly, without hassle. If I did miss the intersection, a zippy U-turn was only seconds away — no umpteen-point angles, no worries. The car has a 22.8-foot turning radius. It would be challenging to find a navigable street that it can’t conquer, or an unexpected scenario where it’s not handy. It certainly didn’t act like a sports car, unless parking on a nickel somehow becomes a sport, though the interior was appropriately cage-like. 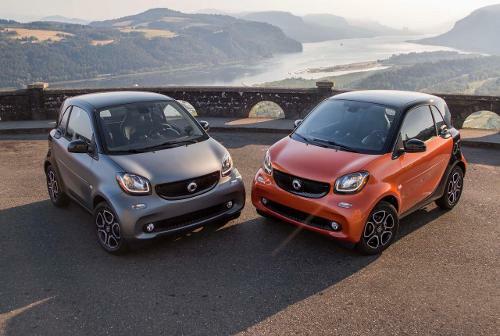 It’s a cute cage, matching the Smart’s two-color peppy exterior design scheme. The canvas seats and dashboard will probably become torn and dirty over time, as fleet usage racks up. Its trunk holds somewhere between two to five small bags, and there are lots of clever little interior storage options in the cabin.